A Franchise Program winning exhibition. Learn more about the Franchise Program. on the UHF42 UStream channel. UHF42 is a month-long screening series broadcast through the live frequency of Wattan, an independent television station based in Ramallah, Palestine. The program showcases 20 recent works by local and international artists, with a single screening taking place each weekday on local television and streaming online after the station’s regularly scheduled news program. The screenings feature a brief introduction by one of the station’s daily news anchors. Wattan has been raided twice and had their frequency shutdown five times, by both Palestinian and Israeli authorities, since it was first established through the telecommunications agreement of the Oslo 2 Accords in 1996. The station continues to provide daily coverage of education, politics, culture, and sports, despite undergoing a destructive raid in February 2012. UHF42 employs Palestine’s first independent television frequency as an exhibition platform, presenting a collection of moving-image works that resonate through their use of televisual modes of production that range from documentation of political events, interviews, and geographic settings, to fictional depictions of historical figures and athletic exercises. These works have been selected based on recommendations by local artists who are familiar with the channel, as well as artists from other regions who have explored the conventions of TV broadcasting abroad. As such, the program draws upon the geopolitical and cultural significance of the television medium, and, by extension, Wattan’s unique regional position as a broadcasting agency operating under precarious circumstance. The following is an electronic-based correspondence that took place in the spring of 2014 between Wattan TV General Director, Muamar Orabi, and UHF42 program organizer, Mike Crane. Mike Crane: I first learned about Wattan TV back in 2006 from a colleague who grew up in Gaza. He described watching Hollywood movies and local news reports on Palestinian television for the first time in the late nineties. My decision to reach out to you was motivated by the news of the raid in 2012. But first, could you briefly describe the origins of Wattan TV? What were the political and economic conditions that allowed the station to be founded? Muamar Orabi: Wattan TV was founded in 1996 after the Palestinian Authority was established. The TV station is the initiative of the Palestinian media community, amidst a period characterized by political and economic development. Prior to this, the Palestinians were not allowed to own independent media outlets. The fact that the founders were doing something new constituted a source of encouragement for other producers, especially the fact that the station was owned by civil society organizations that wanted to help strengthen democratic values. The launching was successful and Wattan TV has grown and developed over the years despite the harsh conditions surrounding us. MC: What programs did you initially show? I’ve heard from a number of Palestinians that you originally showed feature films, Hollywood films, allowing local viewers to see movies on television for the first time. MO: From humble beginnings, the management worked on presenting programs that met audience needs, and certainly Wattan broadcasted Hollywood movies and soap operas, and at the same time we presented news and interview programs that addressed Palestinian issues from political, economic, and social standpoints. Wattan focused also on societal segments that needed attention, such as women, the youth, and the sectors of health and education. MC: How long did it take for you to begin producing original content? MO: At first Wattan produced local programs that included news and discussion programs surrounding contemporary issues. The Al-Baydar program, for example, was a cultural program produced on a weekly basis. MC: How did you lose your broadcasting frequency? Describe the raid in 2012. MO: During the early hours of February 29, 2012, Israeli soldiers entered Ramallah inside “Area A” of the Palestinian Authority and proceeded to Wattan TV. The soldiers entered the station violently, much to the surprise of our crew that was held up. The soldiers smashed the computers, equipment, and doors, and took away folders and documents amidst the inability by our crew to do anything about it. The soldiers had no search warrant and took away equipment and files but left no voucher for these items. Shortly after the raid, Wattan TV raised a lawsuit at Israel’s High Court of Justice, and the case awaits a verdict. Wattan is asking for the immediate return of the confiscated transmitters. The Israeli military had brought back some of the confiscated equipment and files, but the equipment is inoperable, and the financial records were meticulously scrutinized and had various notes written on them. MC: So what is the status of your frequency? Are you permanently switching to online broadcasting? MO: Our technical, licensing, and broadcasting conditions are sound and have been so since 1996. Wattan carries out periodic maintenance and upgrading. Palestine is preparing to transfer to digital broadcasting, which will ensure better protection of our frequency, but currently we focus on reaching out to a broad segment of the population via social media that includes our website, YouTube, Facebook, and Twitter. Wattan’s efforts are extraordinarily successful and we enjoy the highest rating of viewership compared to other Palestinian media outlets. The number of visitors and viewers has been growing rapidly, especially in Palestine where we have the highest ratings. MC: One of the early pioneers of using broadcast TV as both an artist medium and exhibition platform was the UK artist David Hall, who coined the phrase ‘time-based media’ in the early 70s. He used an interventionist approach to working with the medium as a way to destabilize the role that television plays in shaping the illusion of a linear national identity. Palestinian artist Bashir Makhoul similarly uses the phrase “coherence of dispersal,” which he borrows from Edward Said, to consider how contemporary Palestinian art relates to the region’s ongoing, fragmented process of non-linear cultural development, one that is defined by ruptures, fragments, and disjointed narratives. 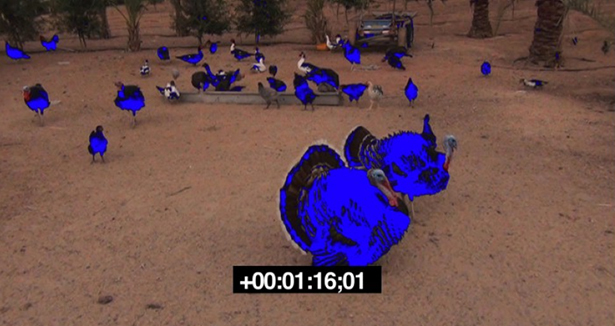 How do you feel about screening artists’ film and video works alongside your news programs? MO: Wattan is an integral part of the Palestinian media scene, and we were the first independent station to be registered and establish cooperation with local and international organizations. We believe such cooperation is necessary in order to keep taking media standards to higher and new levels. We have been in this sector for 18 years and worked with numerous Palestinian producers, and lately we produced a successful drama series. We have also been broadcasting local films by Palestinian producers over the years, and will continue to do so. MC: So how does broadcasting works of contemporary art on local TV and online relate to your broader mission as a news agency? MO: Art can contribute to the preservation of memory and history, therefore we care to collaborate with artists to provide a representation of local Palestinian views. Through this experience of viewing the works on local TV and online, viewers across the region can interact with this program in a recurring way. We have already seen this through the multiple requests from viewers to re-broadcast many of our previous segments involving the arts in Palestine. MC: What relationship does Wattan TV have with artists in the region? MO: Wattan TV is well-connected with the Palestinian society in all different aspects, especially the art sector, which has introduced itself through the use of television, film, and video as an artistic medium. From here emerges our role as a television broadcaster, to cooperate with them to deliver their artistic forms. MC: How do you see the program UHF42 relating to the future of Wattan TV? MO: At Wattan TV we are keen to strengthen our cooperation with partners that share our vision and goals to serve our community, therefore we are working constantly to communicate with others and open up new channels of communication. We hope to encourage the evolution of Palestinian media production. We look forward to this program because it will allow us to present these art works to audiences locally, regionally, and internationally. Mike Crane (b.1982) is an artist raised in Bogota, Colombia, and based in Brooklyn, NY. He earned his BFA from the Cooper Union School of Art.